A fairly standard spirit photograph of the Spiritualist era, showing the allegedly dead daughter of the woman in the photograph. The actual practice of attempting to capture ghosts on film dates back nearly a century and a half to around 1861. Not surprisingly, this type of photography has been controversial and the subject of much debate ever since. The reason that is most given for the lack of widespread acceptance of the credibility of spirit photographs is that the photographs of the past were so riddled with fraud. Strangely though, it is spirit photography that seems to provide the most scientific evidence of ghosts. It is one of the only methods of capturing ghostly phenomena that approaches the standards of science. The reasons for this are fairly simple and include the fact that genuine spirit photos are clearly a physical phenomenon; the amount of energy that goes into making such a photo can be measured by the way it appears in the image; a method of attempting to establish replication is possible; and finally, that it may be possible at some point to develop explanations for how spirit photographs are made and why they exist. One of Mumler's "spirit photographs"
Spirit photography is what seems to be the effect of radiation of some sort on photosensitive film. Such results continue today, although much has changed from the early days of photography. In those days, the photographer first had to prepare a glass plate by coating it with a film of collodion (gun cotton dissolved in ether) containing iodide of potassium, sensitize it by dipping it into a bath of silver nitrate and then take the photograph while the plate was still wet. Each exposure was exciting, each batch of chemicals mixed was a new experiment and every result and reason to take another. Today, we take photography for granted by simply loading film into a camera and snapping a picture. But thanks to advances in film, cameras and technology over the last several decades, it may be that the controversial science of spirit photography is finally coming of age. Of course, nothing of the present could exist without the example of the past. Spirit photography of today differs greatly from that of days gone by however. As mentioned already, the fraudulent spirit photography of the past has damaged the reputation of modern efforts, making it difficult for today’s ghost hunter’s to be taken seriously. Just the mention of "spirit photography" tends to conjure up the images of days gone by, a period that was plagued with questionable methods and often humorous results. But were all of the photographs of the past fake images that were created to bilk people out of their money? It has been claimed that spirit photographs were first produced by accident and only when unscrupulous photographers realized the wealth to be made from them were the first fraudulent images produced. But were they all frauds or did a few fakes muddy the waters for the many? The first "official" spirit photograph has been credited to a Boston engraver named William Mumler, an experienced and enthusiastic amateur photographer with a studio on Washington Street. While developing some experimental self-portraits of himself, a developed plate showed the image of a young woman standing next to him. As he examined the picture, he recognized the figure as that of a cousin who had died 12 years earlier. He later recalled that while posing for the photograph, he had experienced a strange trembling sensation in his right arm that left him feeling exhausted. The photograph attracted great interest and came about during the expansion of the Spiritualist movement. It was investigated by both the Spiritualists and by prominent photographers of the day, who came to believe Mumler's statement on the subject, which said: "This photograph was taken by myself of myself and there was not a living person in the room besides myself." Mumler was soon overwhelmed by public demand for similar photographs and he began taking two hours each day from his regular work as an engrave for Bigelow Bros. and Kennard, one of Boston's best jewelers. Soon, he gave up his job entirely and devoted his efforts to spirit photography. William Black, a leading Boston photographer and the inventor of the acid nitrate bath (an important improvement in the photographic process) was one of the professional photographers who investigated Mumler and his methods. While attending a sitting in Mumler's studio, Black carefully examined his camera, plate, dipper and bath and even kept his eye on the plate from the moment its preparation began, until it was sensitized and locked into the dark slide. After his portrait was taken, Black removed it from the camera and took it to the darkroom himself where, as it was developed, he saw the figure of a man leaning over his shoulder. He had no explanation for its appearance. Although he had not previously been interested in spirits or Spiritualism, Mumler soon began to describe himself as a "medium for taking spirit photographs" and although the spirit "extras" were often unrecognizable and blurred, in many of the cases they were the distinct likenesses of deceased family members and friends. He quickly became the subject of great controversy. Even the testimony of New York Supreme Court Judge John Edmonds -- who had gone to see Mumler convinced that he was a fraud and left convinced that he could actually produce psychic photographs -- failed to quiet the critics and the non-believers. Mumler finally left Boston and moved to New York in 1869, where he opened a new studio and charged as much as $10 per photograph. In 1863, a Dr. Child of Philadelphia reported that he found Mumler to be very willing to give him every opportunity to investigate his methods and that he was himself interested in finding a rational solution to the mystery. Mumler permitted Child to watch all of his operations in the darkroom and allowed him to examine all of his apparatus. Child showed the pictures made during the investigation and he and several friends watched the whole process, from the plate cleaning to the developing. He took the precaution to mark each plate with a diamond before it was used and yet on each was a spirit image. Child failed completely to discover any human agency that could have formed the spirit extras. And with each of these, they differed considerably from any that he had seen before and he had no way of imitating them. The extras that appeared in Mumler's photographs did not meet with universal acclaim though and after more controversy, the Mayor of New York pressured prosecutors into swearing out a warrant for his arrest on charges of "swindling credulous persons by what he called spirit photographs". His trial was widely publicized and he was later acquitted. A number of eminent New Yorker's spoke out on his behalf and in addition, a number of professional photographers also testified that they had studied samples of Mumler’s work and had found no evidence of trickery. One of these was Jeremiah Gurney, the famous Broadway photographer, and he testified that he had witnessed Mumler's process, scrutinized everything and could find nothing that appeared to be fraud or fakery. Mumler was exonerated and his case dismissed. Many modern researchers believe that Mumler may have actually captured something genuine in some of his photos, however, the lure of money was just too big a temptation for him and he supplemented his authentic photos with fraudulent ones in order to pay the rent. Soon, other photographers, both amateur and professional, began to come forward and they also called themselves "mediums", claiming the ability to make dead appear in photographs. Spirit photography soon became a popular pastime and literally thousands of dollars were made from those who came to have their portraits taken. One photographer, William Hope, claimed to take more than 2,500 spirit photographs during a period of about two decades. Few of these photos appear to be in the least bit authentic. Typically in the photographs, ghostly faces appear, floating above and behind the living subjects. In others, fully formed spirits would appear, usually draped in white sheets. Unfortunately, the methods of producing such images were simple. The fraudulent photographers became adept at doctoring their work, superimposing images on plates with living sitters and adding ghostly apparitions and double exposures. The appearance of the fully formed apparition was even easier. Old types of cameras usually demanded that the subject of the photo remain absolutely still for periods of up to one minute, all the while, the shutter of the camera remains open. During this time, it was very simple for the photographer’s assistant to quietly appear behind the sitter, dressed in appropriate "spirit attire". The assistant remained in place for a few moments and then ducked back out of the photo again. On the finished plate, it would seem that a transparent "figure" had made an appearance. This type of "trick photo" was first mentioned in photography journals in 1856. Ten years later, Sir David Brewster recalled the technique when he saw some of the early spirit photos that were produced. He remembered another photo that he had seen of a young boy who had been sitting on a step near a doorway and who had apparently gotten up and left about halfway through the exposure. As a result, the seated image was transparent in the finished photo. Brewster wrote: "The value and application of this fact did not at first present itself to me, but after I had contrived the lenticular stereoscope I saw that such transparent pictures might be used for the various purposes of entertainment." Ghost and spirit photographs and stereographs were sold commercially in America through the 1860's and 1870's but were nothing more than a parlor novelty and were no meant to be taken as genuine spirit photographs. Other methods of obtaining fraudulent photographs were used as well. Prepared plates and cut films were often switched and substituted by slight of hand tricks, replacing those provided by the investigator. And while this might have fooled a credulous member of the general public, slight of hand maneuvers and instances of assistants prancing through photos draped in sheets would not have convinced hardened and skeptical investigators that the work of the spirit photographers was credible and even genuine. However, in case after case, investigators walked away stumped as to how the bizarre images managed to appear on film. For every fraud who was exposed, there was at least one other photographer who was never caught cheating. But unfortunately, there were many who were not so honest. At about the same time that William Mumler was going on trial in New York for fraud, a popular spirit photographer named Frederick Hudson emerged on the scene in London. He was brought to the public's attention by Mrs. Samuel Guppy, a well-known medium of the day. He was eventually investigated by a famous professional photographer named John Beattie in 1873. He carried out a series of experiments with Hudson that were later published in the British Journal of Photography. At that time, Hudson was charging a steep fee for his photos, but only with the understanding that he could not be blamed if nothing unusual appeared, which often happened. In his article, Beattie described how, with a friend, he had examined the glass room in Hudson's garden where the experiments were to take place, the operating room with its yellow light and porcelain baths, the 10 x 8 inch camera with its 6 - inch lens and all of the machinery involved. He also maintained that he had marked the photographic plate to be used and watched it being coated and prepared. A spirit photo taken by Fredrick Hudson. The sitter was Raby Wootton, who, with friends, took the photograph and developed it themselves without allowing Hudson to take part in it. They never realized how easy it would be for Hudson to switch the plate that he gave them to develop! For the first photograph that Hudson took, using an exposure of about one minute, Beattie sat as the subject in profile to the background and Hudson's daughter (acting as the medium) stood next to him. No extra appeared in the photo. For the next experiment, Beattie wrote: "All was the same except that the medium sat behind the background. On the picture being developed, a sitting figure beside myself came out in front of me and between the background and myself. I am sitting in profile in the picture -- the figure is in a three-quarter position -- in front of me, but altogether between me and the background. The figure is draped in black, with a white colored plaid over the head, and is like both a brother and a nephew of mine. This last point I do not press because the face is like that of a dead person and under lighted." Beattie continued: "In my last trial -- all, if possible, more strictly attended to then before, and in the same place relative to me -- there came out a standing female figure, clothed in black skirt, and having a white-colored, thin linen drapery something like a shawl pattern, upon her shoulders, over which a mass of black hair loosely hung. The figure is in front of me and, as it were, partially between me and the camera." Beattie had assumed that Hudson was in some way faking the photographs but was now no longer convinced of this. He was convinced that the figures were not double exposures, had not been projected in some way, were not the result of mirrors or even the result of images that had been manipulated onto the plates during the developing process. What he did not take into consideration though was that the images could have been on the plates all along -- that his own plates had been switched for "trick plates" by the photographer. This seems to have been the standard operating procedure for many of the so-called spirit photographers of the day and it was not realized for quite some time. Many of them, including a Mr. Parkes, who produced a number of psychic images even allowed themselves to be observed while working on the plates. Parkes, for instance, had an aperture cut into the wall of his darkroom so that investigators could see inside while he went through the developing process. The problem was that the investigators had no idea just what plates he was actually developing! In 1874, a French photographer named E. Buguet opened up a studio and also began a career capturing the spirits on film. Most of his photographs were of famous people, most of whom claimed to recognize deceased loved ones and family members as extras. This did not stop him from being arrested for fraud and tried by the French government though. He admitted deception but even then, there were many who refused to accept his confession as genuine, claiming that he had been paid off by the church to plead guilty. In his confession, he stated that his photographs were created by double exposure. First, he would dress up his assistants to play the part of a ghost, orwould dress up a doll in sheet. This figure, along with a stock of heads, was seized by the police when they raided his studio. Buguet was fined and sentenced to a year in prison. Even after this, his supporters continued to exist his photographs were real. Reverend Stainton Moses, the famous medium, was convinced that at least some of Buguet's spirit photographs were authentic. He said that the prosecution of the case was tainted by religious officials, that the judge was biased or that Buguet must have been bribed or terrorized to confess. The 1870’s saw the first general acceptance that there might be something credible to at least some aspects of spirit photography. A number of references to it appeared in issues of the British Journal of Photography and in other periodicals of the time. In the 1890’s, J. Traille Taylor, the editor of the Journal, reviewed the history of spirit photography and detailed the methods by which fraudulent photos were sometimes produced. He approached the phenomenon as a true skeptic, not immediately disbelieving it, but studying it in a scientific manner. He used a stereoscopic camera and noted that the psychically produced images did not appear to be in three dimensions. He used his own camera and he and his assistants did all of the developing and photographing. Strangely, they were still able to produce mysterious results. In 1891, the practice of spirit photography gained more credibility when Alfred Russell Wallace, the co-developer of the theory of evolution, spoke out with the belief that spirit photography should be studied scientifically. He later wrote about his own investigations into it and included a statement that he believed the possibility of it was real. He did not feel that just because some of the photos that had been documented were obviously fraudulent, that all of them could be dismissed as hoaxes. Despite such notable interest in the field, little was heard of spirit photography (outside of Spiritualist circles) for a number of years. But during this time, some fairly spectacular photos did manage to appear and some of them have remained unexplained ever since. Perhaps my favorite of this period has been referred to as the "Lord Combermere Photograph". The photo was taken in 1891 (and first published in 1895) by Sybell Corbett, who was staying with her sister at Combermere Abbey in Cheshire, England. She decided to take a photo of the large library there and used an exposure of about one hour, a fact that she noted in her diary. Although no one was in the room when the photo was taken, the developed plate showed the faint image of a man seated in one of the chairs. The photograph was shown to a relative of Lord Combermere and it was identified as being the man himself. The problem with this was at the time the photo was taken, Lord Combermere was being buried in a churchyard a few miles away. He had been killed in an accident just five days before! The photo has defied explanation ever since. One of the most convincing photographs was the famous image of the "Brown Lady" of Raynham Hall in Norfolk, England. The photo was taken Captain Provand, a professional photographer, who was taking snapshots of the house for Britains Country Life magazine in September 1936. His assistant, Indre Shira, actually saw the apparition coming down the staircase and directed Provand to take the photo... even though the other man saw nothing at the time. The resulting image (shown here) has been examined by experts many times, although no explanation for it has ever been given. In 1911, spirit photography entered the mainstream with the publication of the book Photographing the Invisible by James Coates. It covered dozens of cases of spirit photographs in detail and was later revised and expanded in 1921. It remains one of the most comprehensive books on the subject during this period and it managed to bring spirit photography into the mainstream for the first time. Following the publication of the book, several noteworthy articles appeared on spirit photography, including one by James Hyslop, a Columbia University professor. He wrote an introduction to a series of experiments carried out by Charles Cook of two American spirit photographers, Edward Wyllie of Los Angeles and Alex Martin of Denver. Cook did extensive work with the two men in 1916 and provided them with his own plates and had them developed by a commercial studio. In this way, he eliminated any opportunity that the two men might have had to doctor the images. Cook concluded that the photographs submitted were genuine but in these cases thought the name "psychic photography" better matched the phenomenon. He believed that the two men actually produced the images through some psychical means, rather than actually photographing ghosts. Despite the failure to debunk a number of the spirit photographs of the time, the reality of the photographs was not accepted by the scientists of the day. As it is today, the majority of them simply refused to examine the data and assumed that fraud was more than adequate to explain the findings. One of the few exceptions was Sir William Crookes, the distinguished chemist and physicist. For 30 years, he was a member of the Royal Society and was known for his discovery of thallium, his studies of photography and other scientific work. At the invitation of several skeptical members of the Royal Society, he agreed to take on a six month study of psychic phenomenon. Instead of just six months though, his work continued for years and he came to the conclusion that much of what he studied (including psychic photographs) was genuine. He presented his findings in both book and article form but soon became discouraged about convincing most of his scientific colleagues of the reality of what he was doing. He endured ridicule and disdain, but never wavered from his beliefs. More than 25 years later, he would maintain that spirit photography could, and did, exist. Another fascinating photograph has been dubbed the "Tulip Staircase Ghost." It depicts a cowled figure that was photographed by a Canadian tourist, Reverend R.W. Hardy, who was visiting England in 1966. The photo was taken at Queen’s House in Greenwich and it was intended to be solely of the grand Tulip Staircase there. When the photo was developed, the figure was seen, apparently climbing the stairs. The photo has been examined many times over the years, but thus far, has withstood all allegations of fraud. The emergence of modern science in the first half of the 1800's had helped to dispel the superstitions of the past but scientists were unable to connect the mysterious evidence obtained by spirit photography to the progress they were making in other fields. Because of this, most of the investigation and research into the field was carried out by Spiritualists, who believed that far too many of the photographs were genuine, thus validating their often unpopular beliefs. The debunkers of today simply point to the usually ridiculous images that were produced as proof that the entire field was corrupt. As most of us know though, nothing is ever that clear cut when it comes to the paranormal -- nor are answers ever that easily obtained. 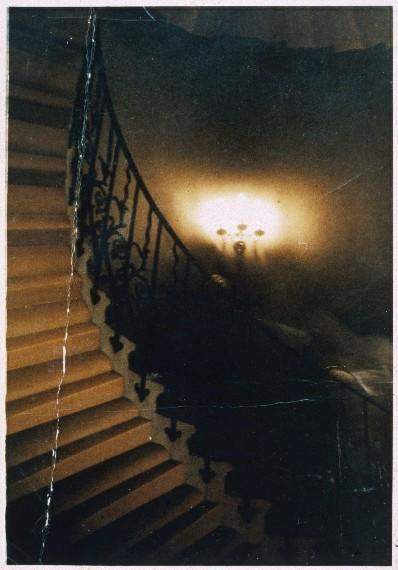 As time passed and photographic techniques and equipment became more advanced, researchers began to discover that some of the photographs being taken in allegedly haunted locations could not be explained away as film flaws and tricks of light. Gone were the days of phony photos that were taken by so-called spirit mediums in studios. They had been replaced by often accidental photos that defied all logic. Regardless though, fake spirit photography has flourished ever since because in addition to fraud, there are also literally thousands of photos that allege to be ghosts that are merely mistakes caused in processing or during the actual photography. Camera straps, reflections and light refractions are often mistaken for ghosts on film... but that’s not to say that no real photos of ghosts exist! In fact, there have been a number of such photos that have been taken over the years for which no clear explanations exist. Photos can often appear for which no evidence of fraud, trickery or mistakes can be discovered. The photos presented here all lay claim to being legitimate. In each case, the photographer claimed to be surprised by the end results of the photograph.